Sixteen brilliant and sparkling diamonds accentuate the 14K white gold in this small heart with cross diamond pendant from Apples of Gold Jewelry! 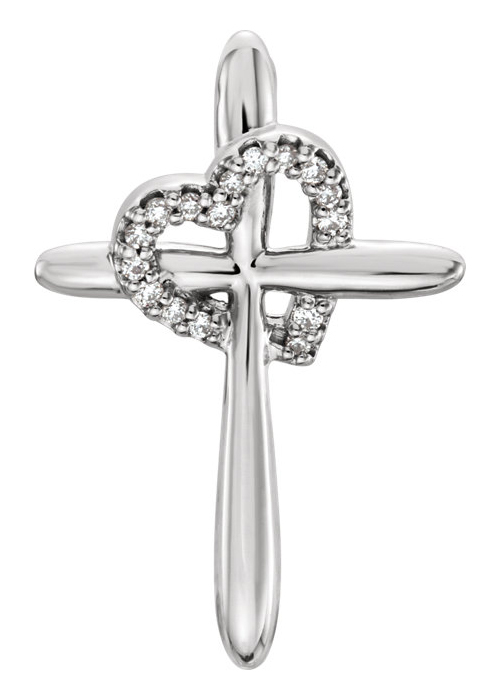 This women's pendant, which measures 3/4 of an inch tall and 1/2 of an inch wide, features a polished cross and a small heart draped around the cross, with sixteen diamonds inside, totaling 0.04 carats. The diamonds are also rated G-H for color and I1 for clarity, and when coupled with the white gold of the pendant, will allow you to sparkle during those special occasions! "But God commendeth his love toward us, in that, while we were yet sinners, Christ died for us. "(Romans 5:8). We guarantee our Small Heart with Cross Diamond Pendant to be high quality, authentic jewelry, as described above.